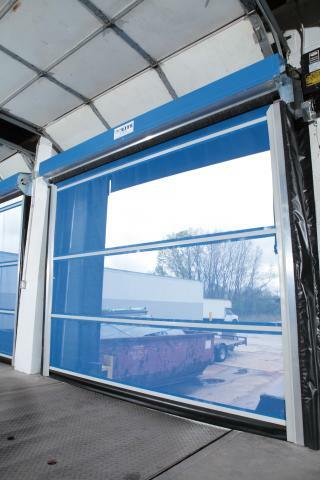 Based on Goff’s G2 Doors – G2 Lite Mesh Doors are an economical option for reducing heat and keep bugs, birds, and pests out of Dock Door Openings. *Please Note: G2 Lite Doors are for interior use and are Not wind load rated. They are Not Designed to Auto Reset. Please see Goff’s G2 Bug Blocking Mesh Doorsfor a door with those features. Significantly reduces heat while allowing light into work areas. Increases security-deters trespassing, theft and vandalism. Resistance to all ultraviolet rays and is rot, tear and mildew resistant. Two year warranty on materials & workmanship and motor drive mechanism. 3-year limited warranty on materials and workmanship. Warranty excludes electric motor and spring-assist roll-up mechanism; warranty on these items is 1 year. Goff’s reserves the right to repair or replace warranty items at its discretion. Have this product? Let us know how it works for you! Click here to send a Testimonial! We design, manufacture and install clean rooms. We were looking for a high-speed roll-up door to provide over size equipment access into our clean rooms. We did an internet search and found Goff’s Vinyl Roll Up Doors. Goff’s Vinyl Roll Up Doors have become a great solution for our clean rooms. Goff’s Doors are high quality and aesthetically pleasing with good longevity and great pricing. We will continue to use Goff doors in the design of our clean rooms. “Goff’s was very helpful and the product worked perfected. I like the wide selection of products you supply. I have been a Goff customer since 1985. I as well as my customers have been very happy with the product and installation. It has always been a pleasure to work with the company and it’s employees who provide excellent customer service. I am proud to sell these products as I am always sure to have a happy customer. We installed 5 Goff’s Overhead Vinyl Doors a year ago and are extremely happy with the way the doors work and how they look. Just had a thirdparty food safety audit and the auditor was very impressed with the doors.We passed with flying colors. I would recommend these doors to anyone who wants to control temperatures, dust, and cross contaminations. As a new customer for industrial curtains, I had searched the internet for high quality and durable outside industrial curtains. Many companies had the standard, thinner material. The representative at Goff’s recommended the thicker, more durable curtains. Our ministry is located in the mountains of Northeastern Pennsylvania, where it is common to have high winds and torrential downpours. We’ve had the curtains up for more than a month and have been through at least three notable storms with high winds. I was also impressed with the strapped wind tie downs. Most of the manufacturers only use Velcro straps; however, Goff uses adjustable straps with “D” rings, which are anchored into the concrete floor of our pavilion. The Velcro straps alone would not stand up to the winds of Northeastern Pennsylvania. The ease of installation was impressive! We installed 204 linear feet with 3 handy-men (not carpenters)in 8-9 hours! The installation time included the installation of “D” rings! Working with the staff at Goff was refreshing; they were precise in assisting our organization in ordering the proper measurements needed for our projects. They were thorough in their explanation of their product and very helpful in assisting us in choosing the most appropriate product for the purpose we presented. I highly recommend this company based upon their professionalism and also the high quality of their product. “I can pick up the phone or email any of the staff I know at Goff’s and they will all work with me to provide the best solution to a problem. They are willing to stand behind their products and give me and my customers the support we need. Automatically Open & Close the door after a selected time. * Only Available on the 28″ and 36″ per second motors. Add an Additional 19″ Window to Allow Extra Light In. Operate the door from a hand held remote control. Perfect for use with forklifts/vehicle traffic. * The Motion Detector is not available for 6″ per second doors. The Nema 1 Control is Hardwired and Designed for Interior Use. The Nema 4 Control (Wired) is Hardwired and Designed for Exterior Use. Also available with Locking Option! Nema 4 Control (Wireless) is Designed for Indoor & Outdoor Use! The Pull Cord can be used Indoors & Outdoors! Operate the door with a single push of a button with this economical option. 18″ per second in tube motor. 110 Volt Motor. Limit Switch Controls. 12 Cycles Per Hour Duty Cycle. * 24 with upgrade. 36″ per second external operator. Comes standard with Nema 3 button controller. Allows for a quick setup and easy installation. It features status integrator LED’s for easier trouble shooting, an integrated auto close timer and a proprietary soft start function. It also supports an easy setup plug-in RF receiver module to eliminate additional wiring. 110 Volt Motor. 160 Cycles per Hour Duty Cycle. Chain Hoist Override in case of power failure. Easily Operate the Door by pulling a chain. For low usage applications or areas without electricity available.